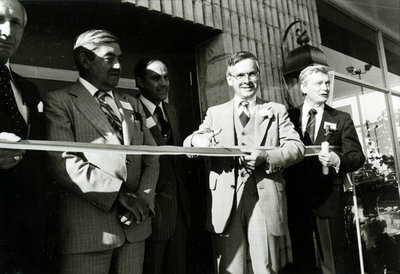 A black and white photograph of the ribbon cutting ceremony at the official opening of the newly expanded Nurse Chevrolet Oldsmobile Dealership located at 1530 Dundas Street East. Durham Regional Chair Walter Beath, Mayor Jim Gartshore, Durham West MPP George Ashe, President of General Motors Canada F. Alan Smith and Bill Nurse, President of Nurse Chevrolet Oldsmobile. Official Opening of the Newly Expanded Nurse Chevrolet Oldsmobile Dealership, September 24, 1980, Photographer Unknown. Whitby Archives A2013_046_001.